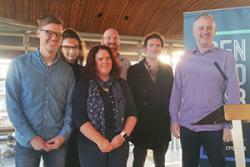 The 'RoboLlywydd' team (l-r Marc Thomas, (Doopoll), Indeg Williams, Delyth Prys, Gruffudd Prys, Myfyr Prys & Dewi Bryn Jones at the National Assembly.Bangor University has created new tools for producing natural sounding synthetic voices in Welsh. They will be able to read aloud any Welsh text from a computer or mobile device. As part of the Macsen project, funded by the Welsh Government, a quick and easy method was devised for preparing prompts, recording individuals reading them aloud, and using information about Welsh sounds to build synthetic voices that sound very similar to the voice of the individual recorded. In the SeneddLab2017 event in Cardiff recently, the team for the Language Technologies Unit, Canolfan Bedwyr had an opportunity to test this method, building a new voice in one hour to give oral information about the Welsh National Assembly, calling it ‘RoboLlywydd’ (‘RoboPresident’). You can listen to the voice on http://techiaith.cymru/2017/04/robollywydd//?lang=en. The Macsen project has also developed a ‘toolbox’ for developing and improving speech recognition for Welsh, including tools for analysing speech corpora and aligning them with text, and new types of acoustic models from the recording the LTU has collected so far with the crowdsourcing Paldaruo app. Work on improving Welsh speech recognition is ongoing, and the LTU team are appealing to all Welsh speakers and learners to join in, record their voices on the Paldaruo app, and contribute them to the project. Developers and anyone else with a little coding knowledge can download and extend Macsen to speak with their own voices and/or to add new questions to the digital personal assistant system.